I've been curious for a while about the genetic similarities between Arabs and Iranians. Can anyone point out some genetic studies on these two groups that would compare their respective genetic makeup? Esfahanis are closest to the Lebanese, Shirazis are closest to Tehranis. Iranians from Samarkand are closest to Azeris. Our primary purpose here is to define the relationships of Assyrians to their closest neighbors in the Middle East, so we will focus on seven groups that appear at the top of the "tree." Of these, Iranian and Iraqi are defined by the country of origin, after exclusion of Kurds. Jordanian, Lebanese and Turkish also mean the country of origin. Assyrians and Kurds refer to specific groups of people. All those studied were indigenous people of the area whose roots in their geographic locations go back to at least 1500 A.D. 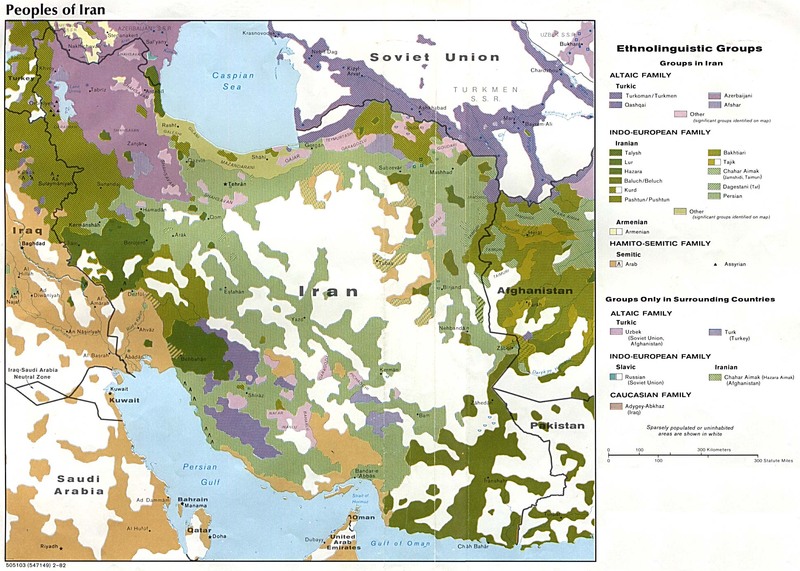 Relationship pairings are shown: Turkish and Iranian, and Assyrian and Jordanian are "loose" pairings; Druse and Lebanese form a closer pair; and Iraqi and Kurdish people form an extremely close pairing. The closest genetic relationships of the Assyrians are with the native populations of Jordan and Iraq. In point of fact, however, all of the seven populations of interest are quite close to each other. There are no wide separations between any of them. This despite the fact that they contain members of three major language families: Indo-European (Iranian, Kurdish), Turkic (Turkish) and Semitic (Iraqi, Jordanian, Lebanese - Arabic; Assyrian - Aramaic). As the authors state, "In spite of the complex history of the Middle East and the great number of internal group migrations revealed by history, as well as the mosaic of cultures and languages, the region is relatively homogeneous" [genetically]. The least heterogeneous zone of Asia "is observed in the Near East, where the highest population densities have existed the longest, especially in the central part (Mesopotamia). Ten thousand years of agriculture, ancient urban developments, and internal migrations are probably responsible for this homogeneity." Thus, in that part of the world with the most ancient civilizations, an underlying genetic homogeneity has been "masked" by great cultural, religious and linguistic heterogeneity. I think South Iran has negroid influence from slavery. LOL! You are so stupid. The first error is that you say Iranians. The second is that you say Arabians. Iranians and Arabians are Nations but not a race. The question is how similar is the genetic of Iranians and Arabians. You must say where is and how similar is the genetic of Iranians and Arabians. In Kuwait, Iraq, Oman, Libanon, Egypt it is very high. But the other parts very low. Both are not real Iranians! Watch your language dude! This is a forum for civilised exchange of thoughts. Keep up the emotionalism and you'll soon be banned. Sorry who are then the real Iranians??? Those blond and blue eyed ones? I have been 11 tines in your country I saw all over no one single blond one. I all brunettes you guys call blond, you even do not know what is blond. you will say maybe the Persians... okay..then why they were making only sculptures of curly black haired people as Persians? Blease be realistic..Do not dream of something you do not have. It is okay, races are different. I don't see it. And did African slaves enter Iran? i thought that was just in Southern Arabia. Yes the Mongols had not an as great impact on the peoples of Iran than Turks, if talking about mongoloid admixture. That guy who some suspect to have Negroid admixture is most likely a Dravidic mixture which has become common in some southern parts of Iran. The most extreme of these Dravidic people of Iran look like the south Indian Dravidics and near to Weddoid. There are Negroid (former-slaves) at the southern coast of Iran, but in rather small numbers, they have mixed less with other peoples, nothing significant. At those areas there was a more important "Gulf-Arabid" mixture with locals, the guy in the picture could be one of those. A more "Iranian" variant of these darker Iranians are original Iranian people who have mixed with the old Elamite people; these are suspected to have been a more Europe branch of the Dravidic people with typical Iranian traits like the long "Iranid" skull. Many Persians of today are likely to have that Elamite admixture, this makes their skin colour pretty dark for europids but their other anthropological traits are Iranic. You might have been to Iran Turk, but if you were searching for blond people, you had a false target. Blond people a very seldom in Tehran, I personally have seen two blond Cro-Magnoids when I was in Shiraz for two days, that was all. What you can find under real Iranian people are europid people mainly long skulled Irano-Nordoids and Cro-Magnoids these are the main Iranic types. They seldom retain their bright eye and hear colours of their childhoods. These Iranic peoples are more or less the descendants of the Persians and the original migrating IE people. Nobody claims today that the original Persians were blond Nordics, they are fully Europid with no middle-eastern round-skulls or mongoloid slit-eyes among them and thus very similar to other original europid IE people. But the numbers of Persians are rather low today. okay..then why they were making only sculptures of curly black haired people as Persians? Dark brown or Black hair was common for that part of the IE people, Hellenes as original IE invaders had also a dark hear colour, this has nothing to mean. The split of the PIE people happened much more than 5000 years ago. If you are searching for Indo-Iranic, Germano-celtic, Slav and Romanic and Torcharian... people being the same people and looking the same, you have to travel back some 10000 years. The curly hear was because it was fashion in that period, Assyrians and Babylonians had them to and as masters of all middle eastern people the Persian accepted that these royal symbols. Persians had normally long wavy hear. You are a Turk, either you are a bright variant and descendant of Asiatic Greeks and other IE people (Lydian or Iranic for example) living in today Turkey, thus you look European despite thinking being a Turk. The European look can also come from the so called "European-Turks" of the Osman period. Or you are the descendant of some pre-IE Anatolian people, some Armenoid or round-skulled middle-eastern/Caucasus-Caucasian variant. Or a mongoloid real Turk with those typical traits. The last two cases are the most likely and thus most Turks are Europids with more or less heavy non-IE traits or even alien race (mongoloid) admixture. Iranic people living in Iran on the other hand are mainly much more Europid and IE anyway, their skin colours might be darker since they didn’t live at the Altai mountains 1500 years ago, but from their stature, skull shape and culture they are clearly relatives of today’s IE European Europids. Original Turks on the other had have no connection to the IE and Europid people. They only recently came to Europe and only very recently have started to claim connections to IE people. The very word Turanian has in fact nothing to do with Turks, Turan is the land of Tur of the Iranic mythology (IE), he appears in Germanic mythology as Thorburn and he was the mythological ancestor of the Tocharian’s (Tor/Tur), the IE people of the east closely connected to the Germans. So why are you Turks using that name ? and stony-hearted kings will seize the throne. The three will blur, as if they were the same..."
Do You Consider Iranians to be Europid?